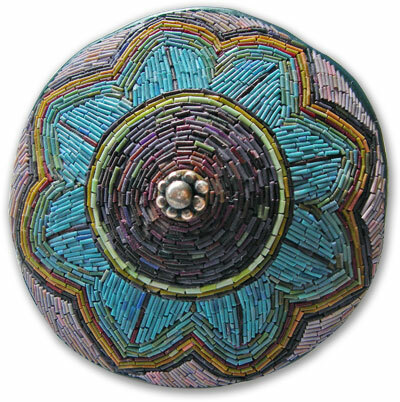 As I considered which polymer clay artist best captured the spirit of Earth Day, Cynthia Toops‘ work came to mind….because she uses so little clay in her fine micromosaics (pictured here). I was thinking small and I laughed at my knee-jerk reaction to our environmentally incorrect medium. Many art supplies fall into the same shunned petroleum-based category. Using less clay shouldn’t be the sole criteria for being sensitive to the environment. Using the clay carefully and wisely is important. Kathleen Dustin has posted an article about thinking big that is more to the point both for Earth Day and for our own artistic growth. I’m also reading more and more articles about the development of biopolymers and I look forward to the day when we no longer have to make apologies on Earth Day. Every product we use has consequences intended or not natural or not. Using corn instead of petroleum to power vehicals sounds good, but the energy requirements to make it are more than the energy it produces. And burning food products raises the cost of the food. There are no easy answers or completely right answers. Except maybe conservation of all resources. I met the President of the Furniture Society a few weekends ago. He cautioned us against apologizing for the negative environmental impact of polymer clay. They are going through a similar issue with endangered woods. He argued that its OK for woodworkers to use these exotic woods because they use so little and treat the wood in a way that honors its beauty. The real culprit is the slash and burn of the endangered forests and they are lobbying for changes in agricultural practices to protect the remaining forests. Not sure that I agree that since we use a miniscule percentage of the oil used every day in the world, we don’t have to be concerned about using a non-renewable resource. But I do agree that unless we slow down the big users of oil, we won’t have clay to play with down the road. Your post today inspired me to think of some ways polymer clay can be earth friendly. I know I waste very little clay, if any when I’m working, reusing it for base beads and under painted objects. And I know the polymer clay community as a whole has been recycling tins and other household items by giving them new live by decorating them with clay. We do what we can! i am so glad i found this post. i was so sad at first learning about polymer clay, even though I have new knowledge of it’s base, I will learn more about how i can use it’s more eco friendly alternative as well as what i can do with the pc i have in my possession already to make them more friendly as best I can. How did I miss this post. I love Cynthia Toops’ work. I’m so glad that that PCD includes these daily thumbnails of past posts, so we can go back to review gorgeous work.